After more than 30 years, SSE is still considered by many to be the definitive, authoritative discussion of the so-called B. H. Roberts versus Joseph Fielding Smith controversy. The truth is, however, that SSE distorts the history of events in 1930 and 1931 and, as a result, presents a negative view of Joseph Fielding Smith's role in those events. Certain aspects of SSE almost suggest an underlying purpose, namely undermining the integrity of Joseph Fielding Smith. The world is deserving of a more accurate and favorable view of Joseph Fielding Smith's role in the 1930 and 1931 events. This article will attempt to identify some of the distortions in SSE that are perpetuated in books, articles, and web sites to this day. SSE Avoids Joseph Fielding Smith as "President"
By the time SSE was published, Joseph Fielding Smith had served 19 years as President of the Quorum of the Twelve, four years as a Counselor in the First Presidency, and two and a half years as the tenth President of the Church. Twenty percent of SSE (4,100 words) involves the ministry of Joseph Fielding Smith, yet the reader is never informed that Joseph Fielding Smith served as President of the Quorum of the Twelve, as a Counselor in the First Presidency, or as Church President, and Jeffery carefully avoids the title "President," preferring instead to call him "Apostle Smith." In fact, not once in SSE does Jeffery refer to President Joseph Fielding Smith as "President." This point should be emphasized because it reveals SSE's obvious bias against a Church President: Not once in SSE does Jeffery refer to Joseph Fielding Smith as "President." In SSE, Jeffery quotes three First Presidency Counselors, each of whom he refers to as "President" — George Q. Cannon (once, see p. 73), Anthony W. Ivins (twice, see p. 74), and J. Reuben Clark, Jr., (three times, see pp. 42 & 66). The problem is that Jeffery claims to have taken into consideration "everything" he could find "that came from members of the First Presidency" (Dialogue 9 [Autumn 1974], 29) as he searched for an official Church doctrine on organic evolution. Joseph Fielding Smith was called to the First Presidency in October 1965. Yet, SSE doesn't deal with or even acknowledge what President Smith published on the subject of organic evolution while serving in that capacity (see "Organic Evolution and the Age of Man" in Answers to Gospel Questions, vol. 5 [Salt Lake City: Deseret Book, 1966], 112-117). Click here to read President Smith's article and then ask yourself: Was Duane Jeffery unable to find this chapter in President Smith's book? Yet he had no trouble finding the book itself while working on SSE's footnote 57 (SSE, 72). Did he not read the book? Or did he consider President Smith's thoughts unworthy of consideration in SSE's search for truth? Does this not suggest that SSE was trying to undermine the integrity of Joseph Fielding Smith? In SSE, Jeffery quotes five Presidents of the Church, each of whom he refers to as "President" — Brigham Young (15 times, see pp. 52, 55, 56, 57, 58, 64, 72, & 74), John Taylor (twice, see pp. 58 & 73), Joseph F. Smith (six times, see pp. 61, 62, & 70), Heber J. Grant (five times, see pp. 62, 73, & 74), and David O. McKay (three times, see pp. 44, 66, & 67). Once again, it must be asked, was Duane Jeffery unable to find these passages in the book? Again, he had no trouble finding the book, the "1972-73 Melchizedek Priesthood manual," while working on SSE's footnote 57 (SSE, 72). Did he not read the book? Or did he consider President Smith's thoughts unworthy of consideration in SSE's search for truth? Does this not suggest that SSE was trying to undermine the integrity of Joseph Fielding Smith? Joseph Fielding Smith's monumental work, Man: His Origin and Destiny (Salt Lake City: Deseret Book, 1954) was written, according to its author, "to strengthen the faith ... of students in the public schools and colleges, who are constantly exposed to the theories of organic evolution and the higher criticism, so-called." (Man: His Origin and Destiny, p. vi.) Not only did the book continue to be sold throughout the remainder of his life, it receives even wider distribution today as part of Deseret Book's electronic GospeLink library. Man: His Origin and Destiny is also listed among the additional resources recommended on the Church's official web page about President Joseph Fielding Smith. In SSE, Jeffery claims that Joseph Fielding Smith "pushed ahead" with publication of his book Man: His Origin and Destiny, even "though it was not approved." (SSE, 65) Jeffery further claims that "over the years, there seems to have been an almost constant stream of inquiries, both written and oral, concerning the doctrinal soundness of Apostle Smith's book [and] the response from the First Presidency has been consistent." (SSE, 67) There are several problems with Duane Jeffery's claims on this matter. The only public response given by the First Presidency is found in the 1972-73 Melchizedek Priesthood study guide, Selections from Answers to Gospel Questions, which was published in 1972 by the First Presidency and which directs its readers to 35 passages from the book Man: His Origin and Destiny. Did Duane Jeffery not notice this? Again, he had no trouble finding the book, the "1972-73 Melchizedek Priesthood manual," while working on SSE's footnote 57 (SSE, 72). Did he not read the book? Or did he consider the 1972 First Presidency's recommendation unworthy of consideration in SSE's search for truth? Again, does this not suggest that SSE was trying to undermine the integrity of Joseph Fielding Smith? It is clear that President Smith had the support of his Brethren in the Quorum of the Twelve when he published the book, Man: His Origin and Destiny. There are two items of evidence to support this view. 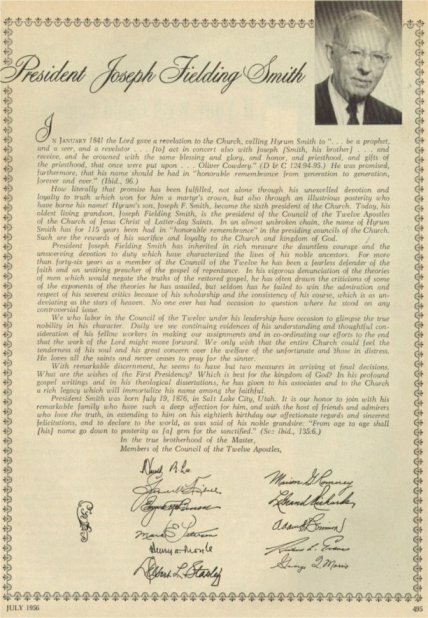 This statement appeared in the Church's official magazine — David O. McKay, as President of the Church, and Richard L. Evans were the editors — over the signatures of President Smith's associates in the Quorum of the Twelve. Click here to read the statement and click here to see the actual signatures of the Apostles that were published with it. Notice how the Quorum of the Twelve acknowledged "his vigorous denunciation" of certain "theories of men" which they said "would negate the truths of the restored gospel." Notice how the Apostles acknowledged he had drawn criticism from "some of the exponents of the theories he has assailed," but notice how they chose to emphasize "his scholarship and the consistency of his course" and praise "his profound gospel writings" as "a rich legacy which will immortalize his name among the faithful." While others were trying to undermine the integrity of Joseph Fielding Smith, his associates in the Quorum of the Twelve were clearly defending it. Click here to read the entire passage from President Benson's talk. Then compare President Benson's phrase "exponent for the theory of organic evolution" with the phrase from the Quorum of the Twelve, "exponents of the theories he has assailed." If there were ever a question, President Benson's 1976 comments make it clear that the 1956 Apostles were talking about President Joseph Fielding Smith's denunciation of the theory of organic evolution in the book Man: His Origin and Destiny. In its assessment of events surrounding publication of Man: His Origin and Destiny, as in many other ways, SSE challenges the integrity of Joseph Fielding Smith. Although the doctrines set forth in these two statements continue to be amplified and clarified by Church Presidents and members of the Quorum of the Twelve, the 1909 and 1925 statements of the First Presidency form the basis for the official position of the Church on organic evolution. The 1931 First Presidency statement has not been included here. The reasons for this are given in the discussion titled, "A Major Defect in the Encyclopedia of Mormonism article about Evolution" found on this web site. Please read that article before continuing with this one. On July 2, 1972, the last General Authority who had participated in the TWL discussions passed away. The following year, in SSE, Duane E. Jeffery published an open exposition of his personal opinions regarding the events of 1930-31 and Joseph Fielding Smith's role in those events. It was largely through Jeffery's efforts, that the 1931 First Presidency decision eventually came to be thought of as a statement on the subject of organic evolution. But the 1931 statement doesn't actually support the no position position because the First Presidency was not talking about organic evolution. So how is the reader of SSE led to believe otherwise? The answer to this question explains how the 1931 First Presidency decision ended up in the Encyclopedia of Mormonism as a statement of the Church's position on evolution. Then, according to SSE, "the subsequent years of calm were broken in 1930 [when] Joseph Fielding Smith delivered a lecture to the Genealogical Conference on April 5." (SSE, 63) There is no mention of TWL. There is no mention of the committee of the Twelve who were reviewing TWL and no mention of Joseph Fielding Smith being a member of that committee. Lastly, there is no mention of Elder B. H. Roberts going about preaching his pre-Adamic creation theory. The misdirection here is huge. Joseph Fielding Smith did not break "years of calm" on evolution, he didn't even mention evolution! According to Jeffery, Elder Smith "spelled out very clearly a disbelief in 'pre-Adamites,' peoples of any sort upon the earth before Adam" (SSE, 63). By not mentioning that Elder Smith was addressing a specific non-evolutionary theory about pre-Adamites, Jeffery misleads his reader into believing that Elder Smith was talking about evolution. As we have previously explained, Elder Smith was responding specifically to the pre-Adamic creation theory then being preached by Elder B. H. Roberts and outlined in TWL. "Even in the Church," said Elder Smith, "there are a scattered few who are now advocating and contending that this earth was peopled with a race — perhaps many races — long before the days of Adam." (Utah Genealogical and Historical Magazine, vol. 21, October 1930, 147) And, as we have already explained, these pre-Adamic beings were not the products of evolution at all. Jeffery portrays Elder Smith's speech as the beginning of a two man doctrinal contest between Elder B. H. Roberts and Elder Joseph Fielding Smith. (SSE, 64) Again, this is a gross and misleading simplification of what was actually going on in 1930 and 1931. Yes, there was a discussion. It began, not in April 1930 with Elder Smith's speech, but in October 1928 when Elder Smith was invited to be on the committee of the Twelve and asked to help with the review of TWL. The fact that Roberts objected to Elder Smith's speech had nothing to do with organic evolution. Neither one of them believed in organic evolution. When Roberts "directly challenged the legitimacy of the remarks, in a letter to the First Presidency" (SSE, 64) he was not advocating evolution, he was trying to justify his own theories and save his book. (TWL, 705) But, the reader of SSE isn't given enough information to understand this. When, in January 1931, "both Roberts and Smith were given opportunity to present their positions ... to the Twelve" (SSE, 64), the issue was Roberts' theory of a prior creation and cataclysmic destruction preceding the Adamic creation, not evolution. Jeffery fails to mention that following the January presentations to the Quorum of the Twelve, Elder Roberts wrote another letter to the First Presidency which "brought the issue right back to the matter of his book" (TWL, 708) and this letter was included as part of the First Presidency's so-called "seven-page directive" (SSE, 64) to the General Authorities. Jeffery's statement that "the two contestants, Roberts and Smith, were thus directed to drop the matter" (SSE, 64) suggests that only two General Authorities had actually participated in the discussions. SSE leaves the reader believing that there had been a heated discussion on the subject of organic evolution between Elder B. H. Roberts and Elder Joseph Fielding Smith. In reality, the review committee consisted of five Apostles, in addition to the Quorum President, Rudger Clawson, who acted as liaison between the review committee and the First Presidency. At times, the discussions had involved the entire "Council of the First Presidency and Quorum of the Twelve." (TWL, 702) And Roberts was repeatedly informed "that the First Presidency and the Twelve could not approve some parts" (Ibid) of his book. And again in reality, organic evolution was not the topic of discussion. For more than thirty years, Jeffery's analysis has been accepted as a scholarly, historically accurate portrayal of events surrounding the 1931 First Presidency statement. IT IS NOT. Jeffery's version of these events as given in SSE stands in stark contrast to the one presented in the BYU Studies version of TWL published in 1994 (see 2nd edition, 1996, as referenced and quoted throughout this web site). SSE twice calls the April 1931 First Presidency decision a "directive" (SSE, 64). A directive to do what? SSE wants its readers to believe that the general authorities were directed that organic evolution, pre-Adamites, and death before the fall would no longer be appropriate subjects for gospel discussions in the Church. In 1986, Richard Pearson Smith expressed frustration with Church leaders who "were not following [the] 1931 First Presidency directive to general authorities." (The Search for Harmony, 271-272.) Smith cites SSE as justification for this audacious accusation. Basically, there are two possibilities: (1) the 1931 First Presidency decision was that publication of TWL without removing it's objectionable features was no longer an option and debate about TWL's controversial theories should cease; or (2) the 1931 First Presidency decision was that general authorities should no longer discuss death before the fall, pre-Adamites, and/or organic evolution within any gospel context. The actions of Joseph Fielding Smith during the years that followed 1931 can therefore likewise be viewed in two ways: (1) he was loyal and obedient to the 1931 First Presidency in every way; or (2) he was defiant and disobedient as he continued his opposition to evolution and continued writing about and defending the view that there was no death before the fall. Let's look at what actually happened during the next twenty years. Joseph Fielding Smith wrote five books and in each one he teaches the doctrine of no death before the fall. The reader is invited to follow each of the following links and read what President Joseph Fielding Smith wrote in 1936, 1942, 1944, 1947, and 1948 about a subject which, according to Jeffery, had been proscribed. Notice that the 1947 and 1948 books were published by the Council of the Twelve Apostles, among whom were Elders Widtsoe and Merrill. Also, Church President George Albert Smith, his Second Counselor David O. McKay and Elder Stephen L. Richards of the Twelve had all served with Joseph Fielding Smith on the TWL review committee in the years 1928-1931, they being four of its five members. Surely these brethren, now senior leaders of the Church, all knew the details of events surrounding the 1931 First Presidency decision. It is therefore inappropriate to suggest that the Council of the Twelve were being disobedient to a First Presidency directive by publishing Elder Smith's writings. It is also unreasonable to think that the 1947-48 First Presidency would have permitted such an obvious case of insubordination. Joseph Fielding Smith did not write these five books in violation of a First Presidency "directive." The fact that he did write these books demonstrates that the 1931 First Presidency statement did not proscribe gospel discussion about death before the fall. Any other interpretation undermines the integrity of Joseph Fielding Smith. Based on comments of the Twelve regarding certain theories in TWL, it is clear that they felt the doctrine of no death before the fall was an accepted doctrine of the Church. Based on books written and published after 1931 by Joseph Fielding Smith and, in two cases, published by the Council of the Twelve, it appears the 1931 First Presidency did not change that doctrine. In our day, the doctrine of no death before the fall clearly is accepted as doctrine. Was Joseph Fielding Smith A Protestant Fundamentalist? Remember, Joseph Fielding Smith and B. H. Roberts were in agreement on evolution and any disagreement between them on organic evolution exists only in the minds of certain LDS scientists. The idea that there had been a disagreement on the subject of organic evolution was carefully cultivated by Duane E. Jeffery in SSE to suit his own purposes, with total disregard as to the effect it might have on the future reputation of President Joseph Fielding Smith. In his foreword to Evolution and Mormonism: A Quest for Understanding (Salt Lake City: Signature Books, 2001), Duane E. Jeffery once again places the 1931 First Presidency decision in an organic evolution context (Evolution and Mormonism, p. xi). Without some discussion of TWL, Joseph Fielding Smith's role in the events of 1930 and 1931 cannot be accurately presented. Yet, neither Jeffery nor the authors, Trent D. Stephens and D. Jeffrey Meldrum, mention TWL anywhere in Evolution and Mormonism. On the other hand, Stephens and Meldrum do faithfully echo SSE in their discussion of Joseph Fielding Smith's role in the events of 1930 and 1931 (Ibid., p. 45). Interestingly, Stephens and Meldrum also quote B. H. Roberts on organic evolution, "The claims of evolution as explained by the philosophers of the Darwin school, are contrary to all experience so far as man's knowledge extends." (Ibid. p. 141). One of his biographers has written of him: "For years there have been those who have set aside his teachings as the 'opinions' of one who is unconversant with the knowledge of the world, and one who is perhaps a little too 'literal' in his reading of the scriptures. But it is not without significance that the Lord, in preserving his life to preside over his people, has placed upon that life his stamp of approval and held it up to us as exemplary." (Joseph F. McConkie, True and Faithful: The Life Story of Joseph Fielding Smith [Salt Lake City: Bookcraft, 1971], 100). The priesthood keys and authority restored through the Prophet Joseph Smith have been transmitted in an unbroken chain from his day to ours. From the day the Church was organized, there has never been a single moment when the Church did not have a Prophet at its head. Occasionally we hear of so-called Mormon Fundamentalists who believe President Wilford Woodruff didn't receive a revelation before he issued the Manifesto. But because Wilford Woodruff held the keys, revelation isn't the real question. Similarly, there are LDS scientists who believe President Joseph Fielding Smith didn't receive a revelation before he settled the doctrinal question about death before the fall. But because Joseph Fielding Smith held the keys, revelation isn't the real question. Based on the things they put in print, some (non)Mormon Fundamentalists and some LDS scientists answer this question with a highly visible and obviously qualified "not always." To these individuals I say, "Believe what you want. But please don't teach anything to my children and grandchildren that challenges the integrity of a Prophet of God."